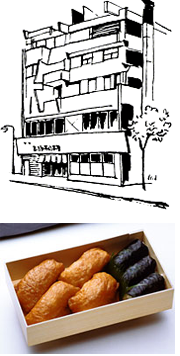 Shinodazushi Sohonten began selling take out sushi in 1877 in Amazake Yokocho in the Ningyocho district in Nihonbashi of Tokyo. Our specialty is “Shinoda”inari-zushi, which theater goers enjoy while watching performances at the nearby Meijiza Theater. The name “Shinoda”itself is taken from a line in a famous joruri drama. Inari-zushi consists of a pouch-like skin of very thin tofu that is deep-fried in oil, flavored and stuffed with seasoned rice. The fried tofu we use is especially made for us, and is extremely thin for seasonings to be well absorbed. In addition to “Shinoda”inari-zushi, we also offer a colorful assortment of other popular sushi treats, including “Norimaki”(tuna, cucumber and other items rolled in flavored sushi rice and wrapped in nori seaweed),”Oshi-zushi”(mackerel or conger eel placed on sushi rice and then pressed), and “Chakin-zushi”(sushi wrapped in a thin omelet-like skin).